The title off the post gives the idea already away: Men alone in the woods (if you get the reference good on you, the movie wasn’t too bad ;)) The idea for the scenic shot seems simple at first, but does come with a number of challenges. The men are Celtiberians, and to add a twist we go for a snow-covered landscape. This is the final picture. Below I’ll show you how I ended up there. Regarding the selection of miniatures only the Celtiberians did suit the idea, as my Corvus Belli ones are depicted with trousers and cloaks. I also have some Celts, but some of them are depicted bare-chested, not very suitable attire if you are out in the snow, even if you are a badass Celtic warrior. The idea itself does thus limit our miniature choices and without the Celtiberians I would have passed on it. I have only a small frozen pond terrain piece, which limits the kind of scenes one can depict and also influences the perspective. Gladly I am in the process of making some more trees, so I had three trees without foliage, but otherwise finished. 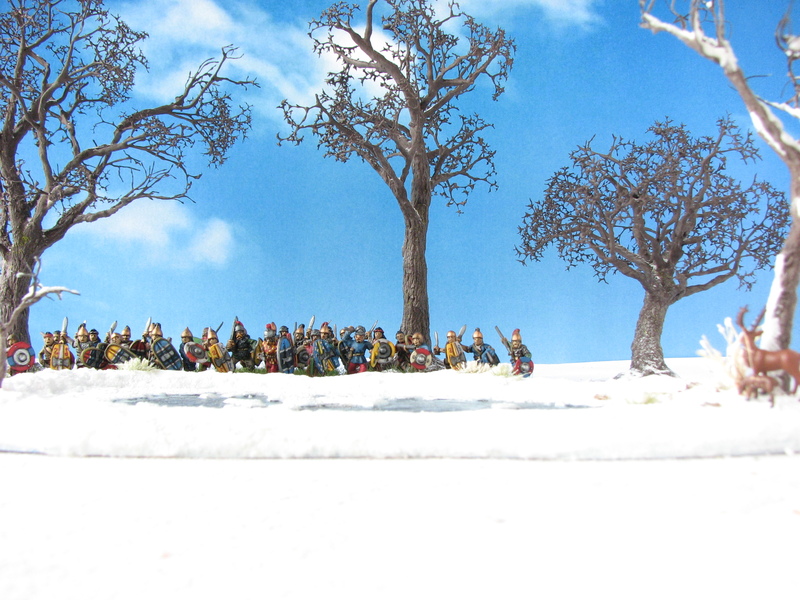 This is the snow terrain piece I used for the shot. Its rim comes in handy when I try to hide the Celtiberians’ ‘summer’ bases. The blue sky will make a good background for a brisk winter day. 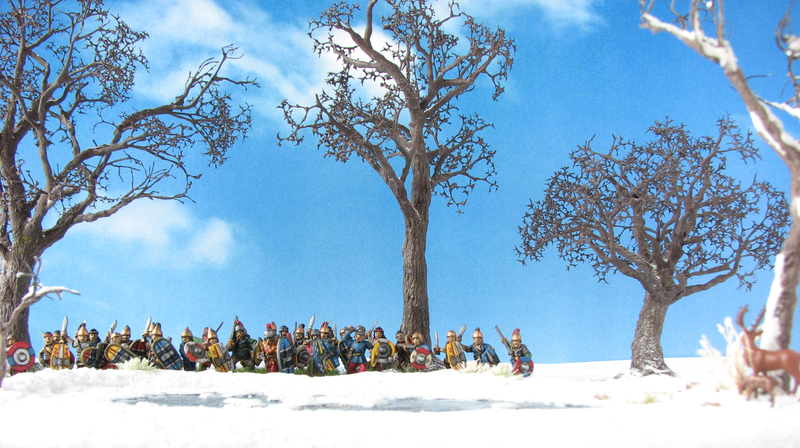 I arranged the trees in the back, with the Celtiberians between them and the pond. This way we have on each picture plane something of interest. 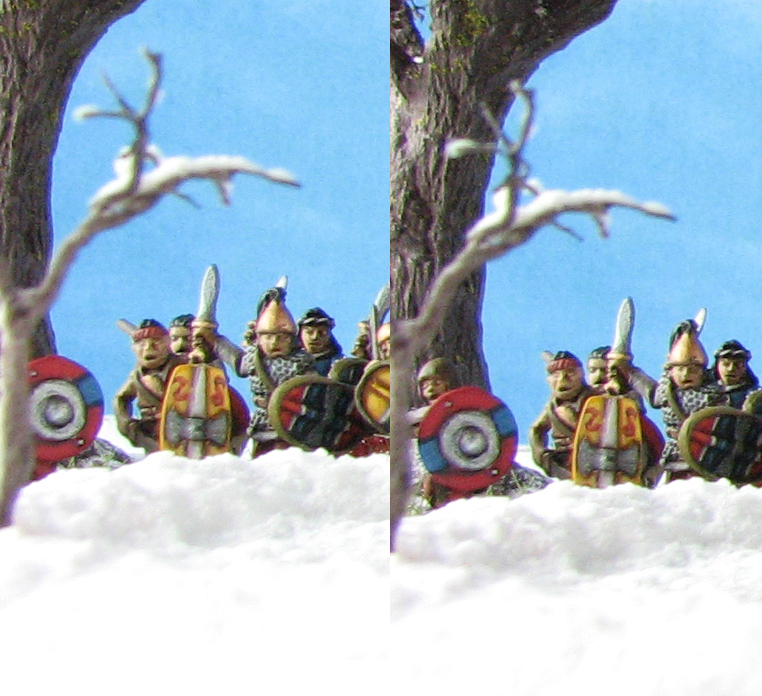 Apart from the snow-covered lake, the trees and the Celtiberians, I also used some prepainted HO Noch deer I bought some time ago for a Sertorius project and to spice up my terrain pieces. The idea was here to give the eye something of interest in the foreground. HO scale works well with 15mm miniatures. 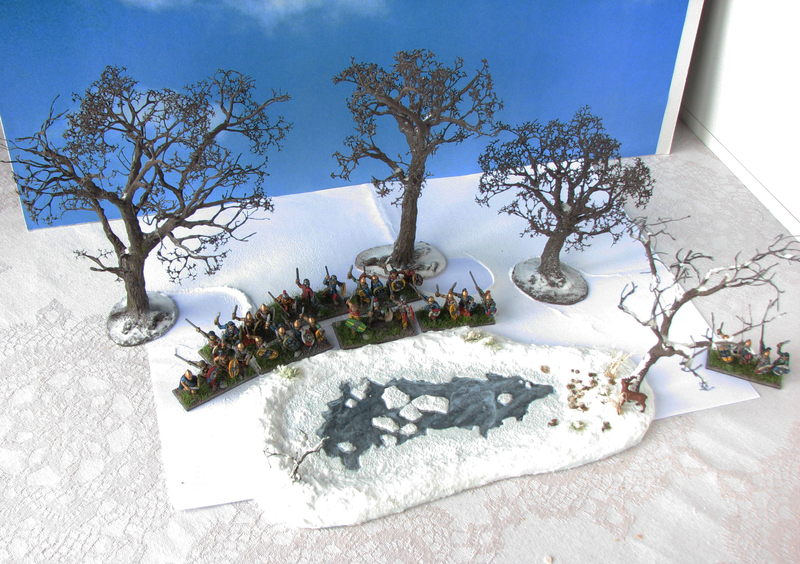 I also used some baking soda to depict fresh snow on the barren trees. This is an easy and removable way to make any terrain piece into a snow-covered one. Just dust it on and brush it off after you took the photo. The table-cloth I used is already off-white, but has a pattern. 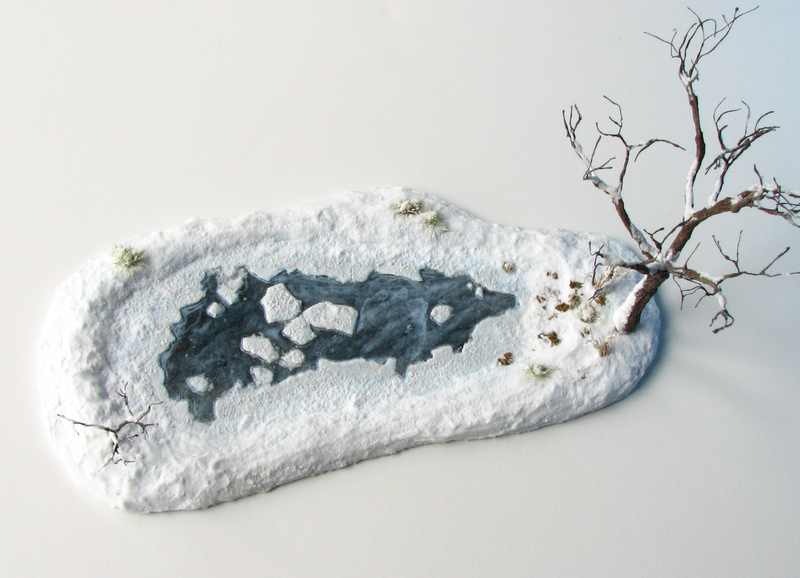 A piece of white paper as ground cover works well to depict a snow-covered landscape if you use it only in the background. It also provides an irregular edge with the blue sky. The small gap between table-cloth and background can ruin the illusion. With a piece of paper that curves slightly this can be corrected. Finally we have to consider the centre piece of our scene: the Celtiberians. How should we arrange them for best effect? I like it if my pictures have clear delineations to at least two sides. Just like a picture frame they give the scene closure and focus the gaze on the scene itself. In this shot we have trees to the right and left, while the surface of the lake adds a horizontal anchor for the eye. 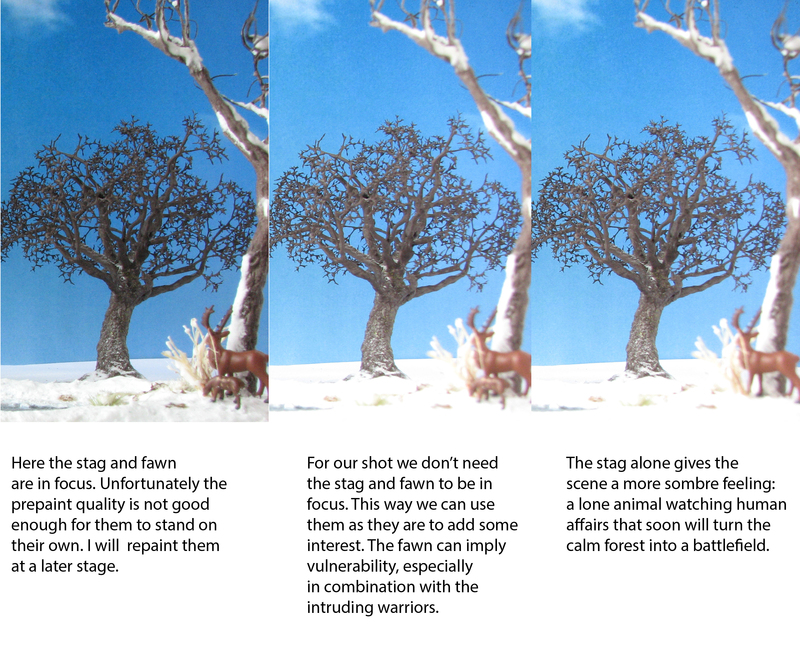 With the stag being placed in front of one of the trees, the spectator can also imagine that we perceive this scene from the stag’s view. 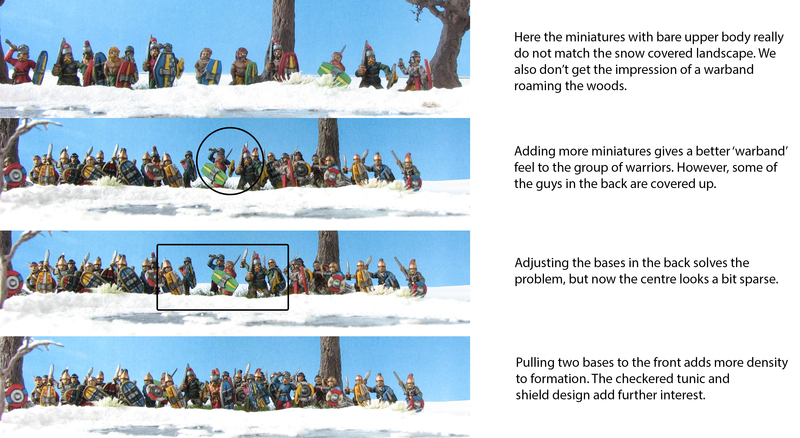 Another important point is to not cut off any miniatures on the borders of the picture. In slightly adjusting the perspective we can get not only the Celtiberian’s shield on the shot, but also most of his body. After I was happy with the scene and decided on a final version, it was time to crop the picture and make some simple corrections to enhance the picture further. If you use a photo editing program never change the actual picture directly, but rather use layers and layer masks for any corrections. This way you never lose your original and can keep on editing without any loss of quality. This is the uncropped picture as it comes right from the camera’s SD card. We only need to crop some of the bottom. Given my Celtiberians are based with a mediterranean summer landscape in mind, the green grass that shows in some places needs to be hidden. In using a small brush, set to emulate chalk, I just applied a couple of off-white patches to the grass, to make it look snow-covered. I decided to add some falling snow flakes to enhance the overall atmosphere. Falling snow cannot be emulated easily while taking the picture, so it is much more convenient to use your photo editor to add a layer mask that will provide you with such an effect. I won’t go into too much detail here, as this excellent tutorial by Steve Patterson shows you how to do it. You can also find pre-made layer masks online for your projects. I am aware that this might be a controversial topic, after all it is all about the paintjob and modelling skills in our hobby. However, I think subtle additions to a picture that do not change the actual paint job and are clearly marked as such can only benefit it. Given that a snowfall normally implies a darkend sky we cna adjust this in making yet another layer mask that only selects the sky. With a grey photo filter we can adjust only these areas and achieve a more realistic appearance. I think the seamoss works great with trees that have foliage, but looks less realistic if one wants to depict barren trees. I think I will experiment more with thin copper wire and see if I can get a similar effect that looks more natural. The deer would benefit from a proper paintjob and filling of some gaps etc. This way I could focus more on it or have it on the same plane as the miniatures. A dwelling or something similar might be quite good as an additional terrain piece to depict more cultivated sourroundings in winter. 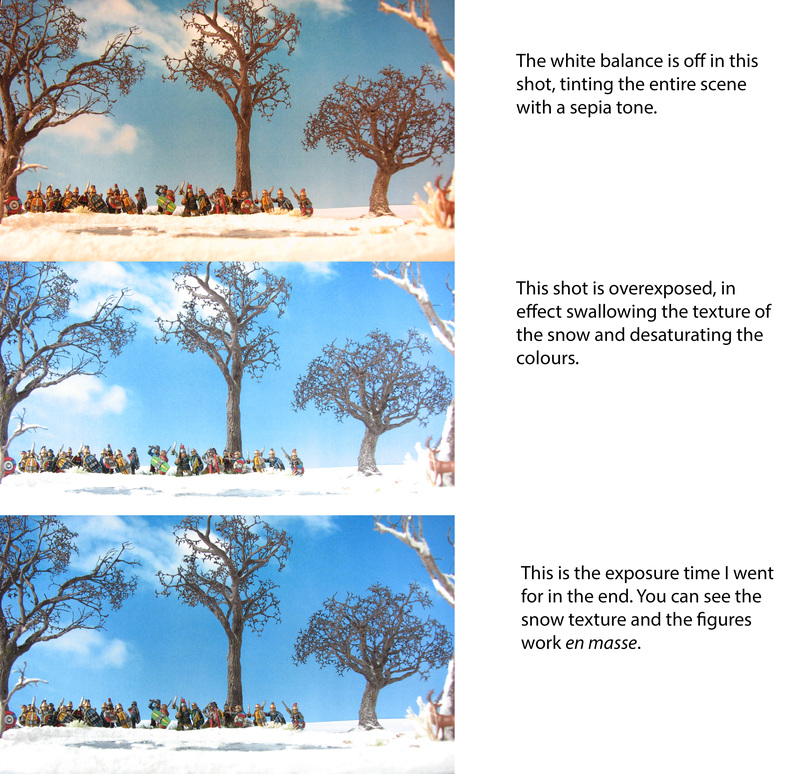 However, I hope you enjoyed this second part of my scenic photography tutorial. In the next part I will cover atmopsheric shots in low light conditions. Dungeons ahoy! Please share below your own experiences or link to your own scenic shots. If you know about photography and have some good advice for me and my readers please do not hesitate to share it! Until next time! Hi Warrior. Thank you for your comment. The tree in the middle is not taller than the one of the left, but might look like it due to perspective and being very narrow. Let’s call it a rather old an straight oak ;). Glad you like the snow theme. Some great tips here, I want to do some photos of larger numbers of models so will have to try something similar. Thank you for your comment. Glad you found the tips useful. I’ll be looking forward to your creations.